Seattle's offensive line, tailbacks and secondary all loom as key positions to watch against the Rams. Here’s a look at the Seahawks’ make-or-break game against the Rams in Los Angeles Sunday, which kicks off at 1:25 p.m. on CBS. The Seahawks may not have much of a chance left to make a race of the NFC West as they trail Los Angeles by 3.5 games (Seattle is 4-4, the Rams 8-1). But there will be no chance without a win Sunday. Few think it will happen, as the Seahawks are 9.5-point underdogs, the biggest spread they have faced since the 2011 season. Seattle also needs a win to stay in the NFC playoff race. The Seahawks have yet to beat a winning team and play three in the next five weeks and four over the next seven. The Rams are smarting from their first loss of the season last Sunday at New Orleans. They are motivated to prove to the Seahawks there is a wider gap between the two teams than the 33-31 last-minute victory at CenturyLink Field on Oct. 7 might have indicated. Seahawks offensive line vs. Rams’ defensive front. 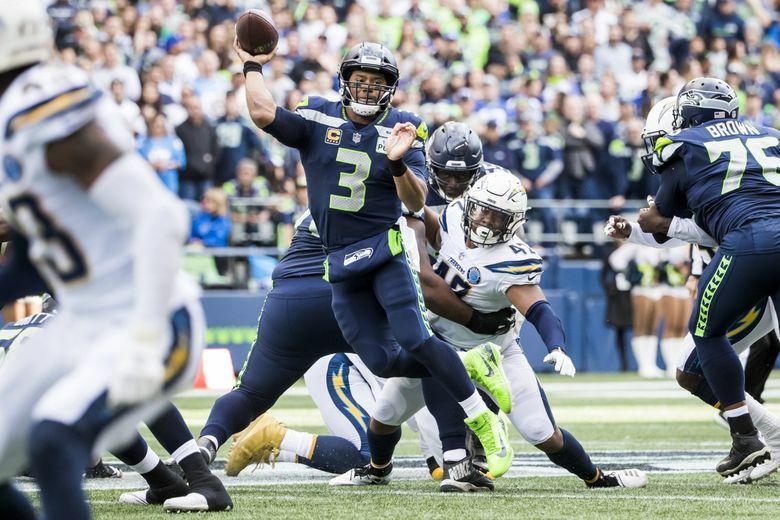 The Seahawks hung with the Rams throughout that October game because of the best performance of the year by the offensive line, which paved the way for a season-high 190 rushing yards and a season-high 5.9 yards per carry as well as allowing just two sacks. The Seahawks offensive linemen spoke candidly of the job they had done against the Rams. “At the end of the day they got lucky,’’ guard D.J. Fluker said. Los Angeles defensive linemen such as Aaron Donald and Ndamukong Suh undoubtedly will remember those words. The Rams have since added defensive end Dante Fowler, a former first-round pick, via a trade with Jacksonville. And one problem for Seattle? It’s unclear if Fluker will be able to play as he missed the end of Sunday’s loss to the Chargers with a calf injury and will be a game-time decision for the Seahawks. Seattle weakside linebacker K.J. Wright. Wright has not played in the last two games against the Rams because of injury, contests in which Los Angeles has scored 42 and 33 points while averaging 5.2 and 7.4 yards per play. The Rams did a ton of damage on crossing routes — the kind of plays Wright has been able to contain during his career. Wright will also play a key role in defending Todd Gurley. The Seahawks did a credible job on Gurley’s in the first game, holding him to 77 yards on 22 carries (though he did score three touchdowns). Seattle held Gurley to just 43 yards on 14 carries the last time it had Wright and Bobby Wagner playing linebacker against the Rams, a 16-10 Seahawks victory in L.A. last October. Will the Seahawks again target cornerback Marcus Peters? The Seahawks really went after the former UW cornerback in the first game and had a lot of success. Peters was beaten by Tyler Lockett for a 39-yard TD and David Moore for a 30-yarder. He also committed a holding penalty on Lockett that negated a sack. Peters, who was playing with a calf strain suffered in September, has continued to struggle, getting beaten for a long touchdown by the Saints that keyed New Orleans’ win last week. He admitted he hasn’t been playing well of late and vowed he would do better. Seattle would be wise to test him early. Running backs Mike Davis/Rashaad Penny/C.J. Prosise. Running back Chris Carson is considered a game-time decision with a hip injury that held him out the last two-and-a-half quarters against the Chargers. Carson had his best game as a Seahawk against the Rams last month with 116 yards on 19 carries, an average of 6.1 yards per attempt. Davis has prepped this week as the starter, and the Seahawks say they remain confident in the abilities of Penny, their first-round pick who played substantially last week once Carson was out (but he had just 11 yards on four carries). The wild card could be Prosise, a third-round pick in 2016 who has yet to have a carry this season and has been inactive three of the last four games. But he might be active this week even if Carson is cleared to add depth and, depending on how things unfold, could get some action. Hill may have to start if Bradley McDougald can’t go because of a knee issue. It would be the first start for the second-year player out of Michigan, and it would mean the Seahawks would be starting four first- or second-year players in its secondary (the others being rookie cornerback Tre Flowers, cornerback Shaquill Griffin and free safety Tedric Thompson). Hill played well against the Chargers. But if he’s starting, the Rams will undoubtedly try to test him. The real key will be tackling in the open field. Los Angeles’ offense is predicated on getting the ball to the likes of Gurley and receivers Brandin Cooks, Cooper Kupp and Robert Woods in one-on-one situations. One missed tackle, as Seattle has found out too often in the last two games, can result in a long gain. Hill, and the rest of the Seattle secondary, will have to be especially disciplined. Those are the first-quarter scoring numbers for the Seahawks and the Rams, respectively. Seattle, for the most part, has overcome its glaring issue in 2017 of slow starts (the Seahawks have scored touchdowns on their first possessions two of the last three games). The Rams have had more than a few games where they have trailed early before exploding. They have outscored teams 104-67 in the second quarter and 91-49 in the third. Given that they are on the road, the injuries and its underdog status, getting a good start seems more imperative than ever for Seattle. The Seahawks used an early interception at the goal line to keep the first game with the Rams close. The Seahawks will need some similarly heady plays this time around. The Seahawks are basically playing playoff games from here on out. But the Rams can match that sense of urgency as they are in a Super Bowl-or-bust-mode. The Rams will also want to show that the first game against Seattle was closer than it should have been. And then there are Seattle’s injuries (Bradley McDougald, D.J. Fluker, Chris Carson). This just seems like a tough one for Seattle to pull off.